"To consume better products is a major societal challenge as well as an important differentiator. Also, I wanted to create a new concept that would inspire our customers and lead them to more sustainable and responsible practices. So I designed fashion for men who like to seduce as well as be responsible". Christèle Merter remembers how she persuaded fashion maker Happychic to launch eco-friendly fashion with a new brand, La Gentle Factory in April 2014. Her eulogistic argument convinced the company to entrust her with the responsibility for brand development. 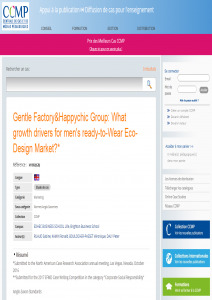 At the beginning of 2016, Christine Merter was informed by the Executive Board of the Happychic Group of the annual target they set for her: to increase turnover by 65% to reach €5 million. At the same time, the objective is set at €30 million by 2020. "Her" start-up is therefore at a strategic turning point in its development and she has to respond to the ambitions of her management and create value for the group and its brands. She had lots of questions: How to achieve growth? What are the growth drivers? Should we diversity the distribution network and opt for a multi-channel distribution approach? Should we opt for a mix of products and create a differentiating complementary offer?